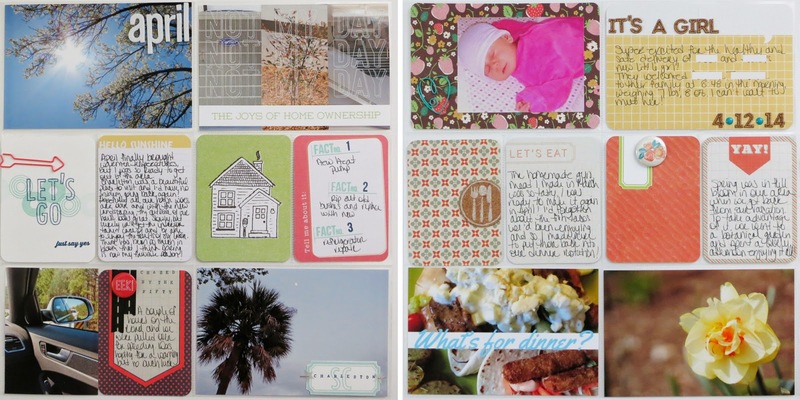 My April Project Life and daily photo pages feel sparse to me in many ways, but they are definitely full of color. It was one of those months where my focus was more on big events that I'll be scrapbooking and not so much on items for pockets. Couple that with an embellishment kit I wasn't crazy about this month and bold, bright PL cards, and I had a recipe for keeping my pages less embellished and making sure there was plenty of white space. I really loved many of this month's PL cards, but some of the colors were quite rich for April, a time when so much around here was budding and blooming. For my PL pages, I incorporated a handmade card as well as a few from the Coral kit. I also added text on a couple of photos in Photoshop Elements before I printed them and found the perfect use for the overlay that came with my PL kit. Since my album contains these pages with full 12"x12" layouts in between each month, I have to make sure I use both sides of the pocket pages. I usually use a page and a half for PL, and then another page and a half for my daily photos. When I only use one page for PL, I'll use one 6"x12" page and one 12"x12" page and that keeps everything even. 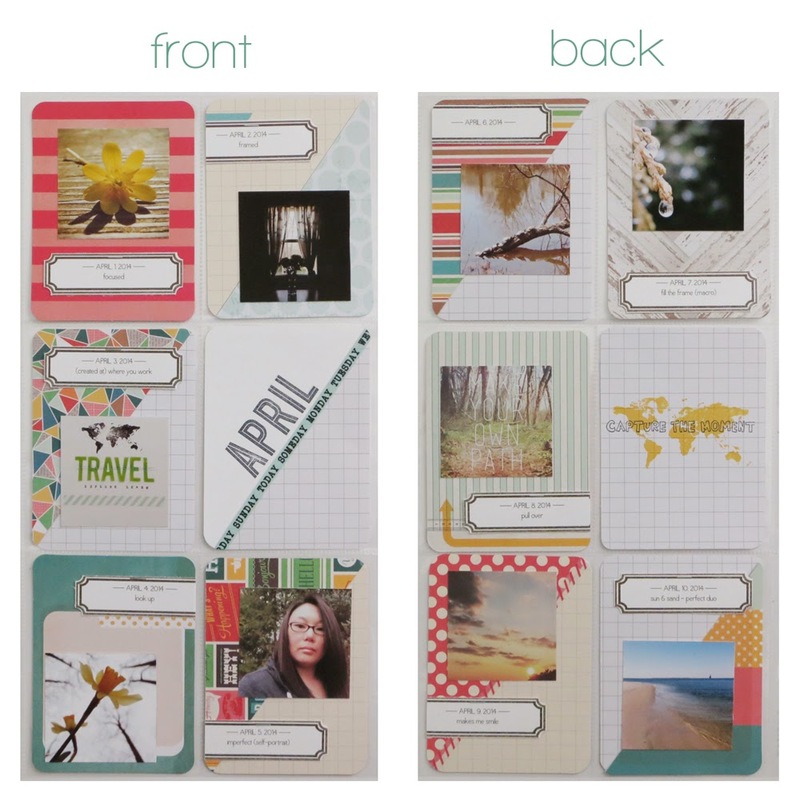 I added Kraft core kit cards to my April PL kit and then cut most of them in half. 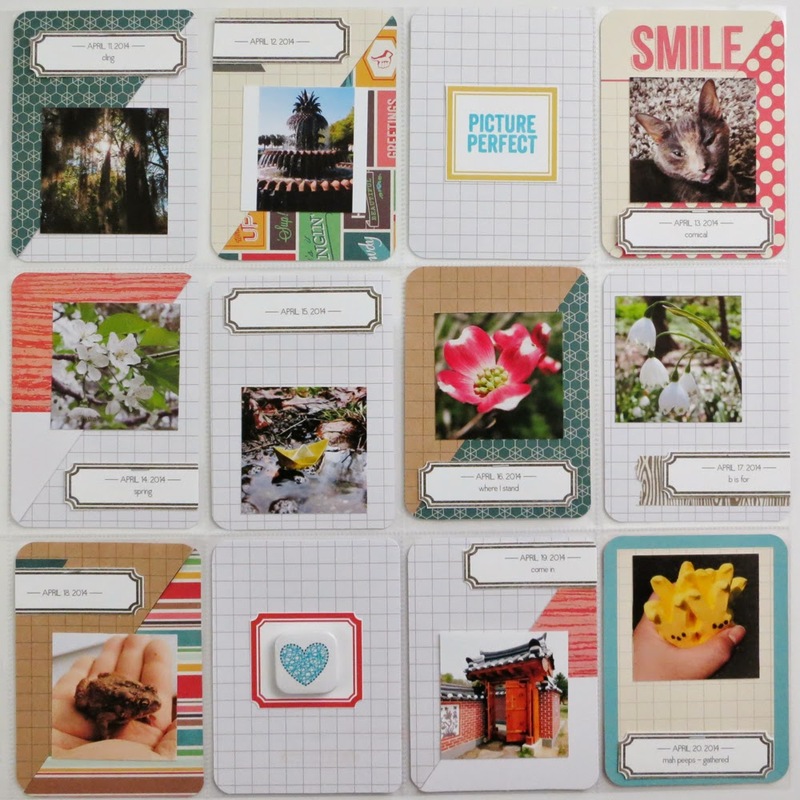 I used grid cards from my stash in order to provide breathing room. I used a couple of flair badges, a little bit of washi tape, and some stamps to provide the finishing touches. Just like in March, I strayed from the daily prompts at times, finding it freeing and rejuvenating to step off the beaten path every now and again. Whether you want to improve your photography, notice more in the world around you, or have extra pictures to add to your Project Life pages, I strongly suggest taking on a daily photo challenge, even if just for a month! Your nature photos are so gorgeous, Elise. You have quite the eye. Love these pages! Love your pages, and your photos are just amazing! 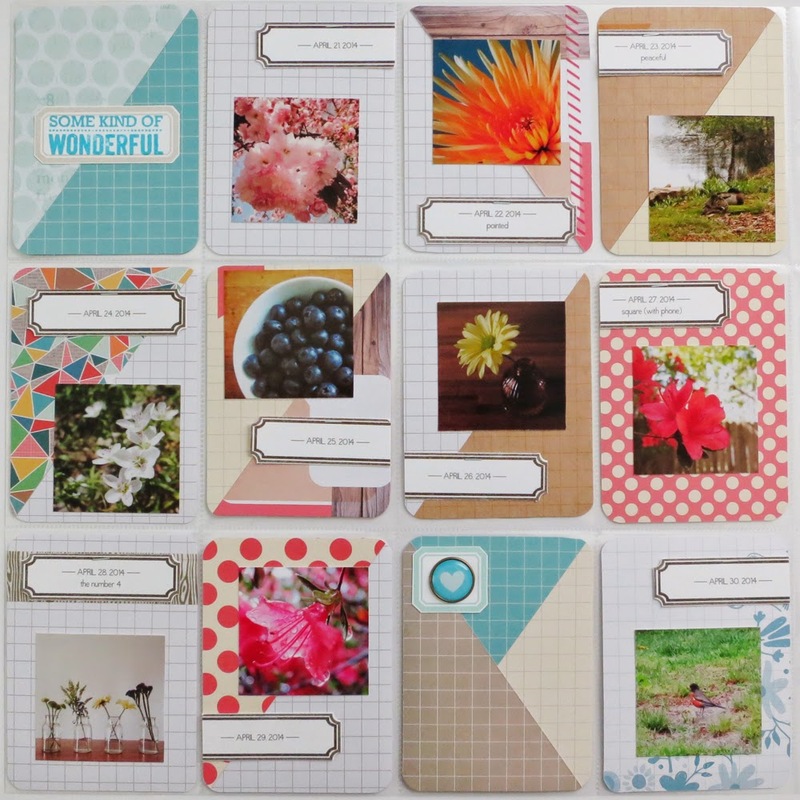 Love your approach to pocket record keeping with 12x12 layouts. In awe of your photos! You PL pages are always great!! I like how you cut the papers on and angle, so cool. I love the PL cards cut in half :) And I really do need to try a photo challenge... I haven't been taking many pictures this year!! You're definitely my favorite PL scrapper ever ! Love the breath room there always is on your pages. Your idea to cut the card in half is brilliant !